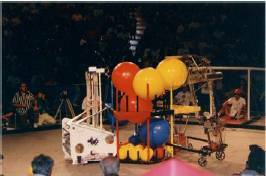 More than 90 schools and engineering companies from over 20 states built "robo-gladiators" to compete in the 1996 FIRST Robotics Competition, HEXAGON HAVOC. 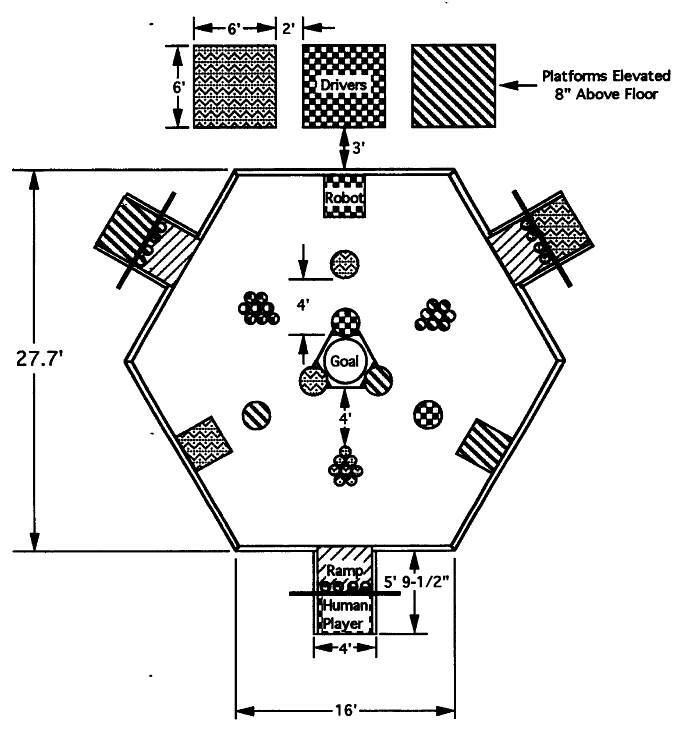 The playing field was a carpeted, hexagon-shaped area with a central goal. Around the perimeter of the field were three stations for human players, who worked with the remote controlled robots on the field to score points. There were twelve 8" diameter balls and two 24" diameter balls per team, color coded to identify team ownership. At the start of each match, all of the small balls and three of the large balls are on the playing field, while the other three large balls are situated on the triangular corners of the goal. The robots were designed and built by the school/engineering teams during a seven week period and were constructed from a wide range of materials including PVC pipe, aluminum, plywood, fiberglass, and structural foam. Each robot had to weigh no more than 120 pounds and fit, unconstrained, inside a 36" cube. The robots used two 12 volt Milwaukee drill motors, four Delco car seat motors, and two Textron pneumatic pumps which, through a customized remote control system, were powered by two 12 volt Milwaukee Drill batteries. In two minute matches, the three robots, with their human partners, scored points by placing the balls in the central goal. The balls were be carried, pushed or thrown into the goal by the robots. The human players were not allowed on the playing field as they were seat-belted down at their stations, but they could score points by throwing balls into the central goal. Points were awarded for balls located in the central goal at the conclusion of each two minute match. Each small ball in or above the hexagonal portion of the central goal was worth three (3) points. Each large ball located in or above the hexagonal portion of the central goal was worth ten (10) points. Each large ball on or over the triangular corners of the goal was worth five (5) points. The winner of each match was the team with the highest score. In the case of a tie, highest large ball in the goal won. If no large balls were in the goal ties were broken by the large ball closest to the center of the goal.